Sebastian Nabel is an artist from Dresden in Germany, who is perhaps best known for his memorable & truly dark skull paintings. Whilst oil on paper is his main medium, Sebastian sometimes works in acrylic or watercolor and has also been known to use his blood if he feels the work calls for it. His use of lighting when creating skull work is exceptional and his paintings have an aged, timeless feel to them. Often small in size, some only 5cm across, the originals look stunning when framed and it is easy to see why collectors are taking notice. 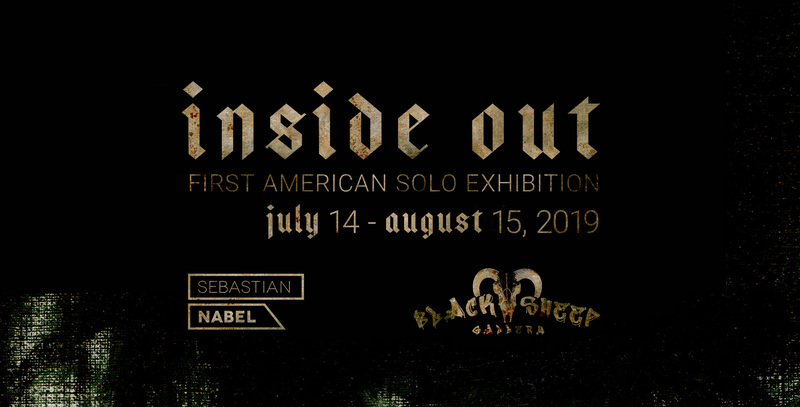 Having gradually built his online following and successfully exhibiting in Dresden and participating in some group exhibitions internationally, the dark spirits continue to call Sebastian to the new world where in July 2019 he will be hosting his first solo show „INSIDE OUT“ in the U.S. with the Black Sheep Gallery. The Black Sheep Gallery, is a creative multi-media studio and glimpse into the darkly eccentric yet enticing perspective of Los Angeles born and raised artist Jill Behunin. Better known on the art scene as Pookie, her biggest objective is to provide a non ego driven, creative atmosphere and platform for artists of all levels...from the “dark artists” who have a following to the “underground street artist” who has never shown. The Exhibition „INSIDE OUT“ will run from July 15, 2019 - August 15, 2019, with an opening reception on July 15 from 7:00 PM – 10:00 PM.